The index opened flat but saw a slow and steady rise on low volume to the highs of the day at 8291 but closed just below at 8282.70, gain of 34.45 points. The broader market was also positive, with 1004 advances to 503 declines. Range as per OI Table is 8000-8600. Call option 8400-8900 added huge 8.09 lacs OI with short covering seen at 8100 and below strike prices. Put option 8300-7900 added huge 11.40 lacs OI with small short covering seen at 8600 and above strike prices. 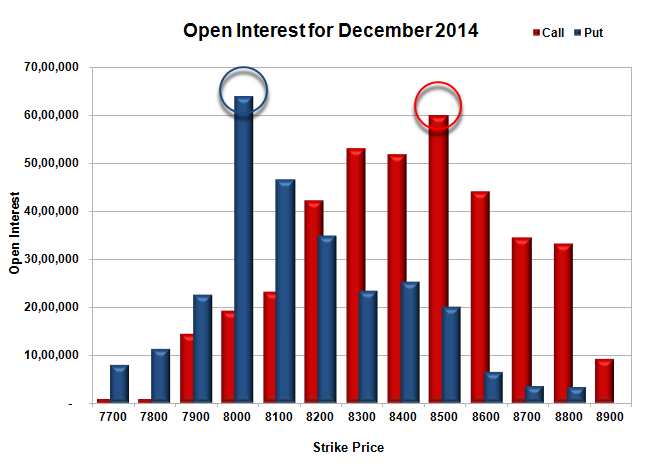 Nifty Open Interest is at 2,11,69,225 down by 1,48,125, with increase in price, most probably short covering. 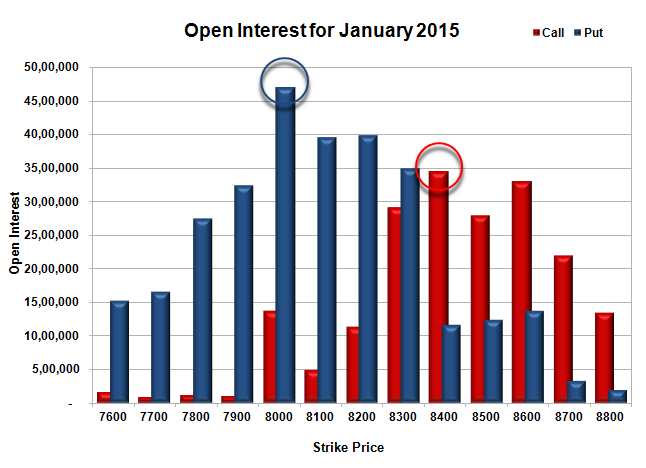 Bank Nifty Open Interest is at 19,63,750 up by 45,000, with increase in price, most probably long build-up. FII’s bought 1.87 lacs Futures, which includes 9843 contracts long build-up and 2374 contracts short build-up, with increase in net OI by 12217 contracts (includes 33382 longs to 25913 shorts for the day) and the Average Price comes to 8577.94. FII’s Index future open contract as on date is 602233 Longs to 76684 Shorts, net long 525549 up by 7469 contracts. Initial support at 8300, with OI of 39.89 lacs and below that at 8200 with OI of 47.82 lacs. Initial and best resistance still at 8400, with OI of 35.39 lacs and above that at 8600 with OI of 35.68 lacs. 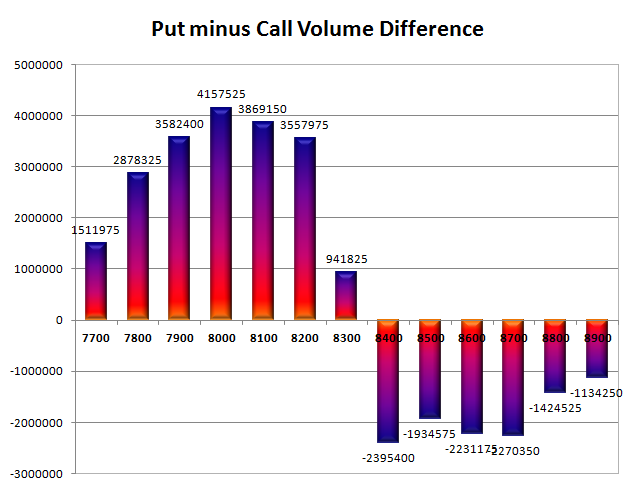 Day Range as per Option Table is 8210 - 8343 and as per VIX is 8217 - 8348 with 8272 as the Pivot. The index opened positive around 8260 but saw profit booking to the lows of 8220 but went on to close flat at 8248.25, small gain of 1.95 points. The broader market was also positive, with 775 advances to 738 declines. 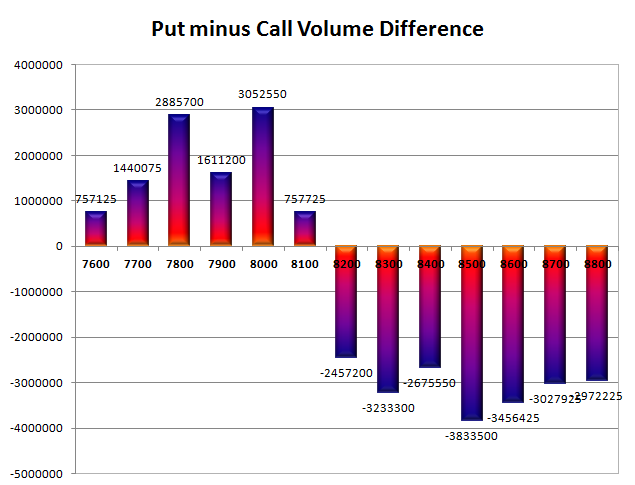 Range as per OI Table developing at the start of the series is 8100-8400. Call option 8200-8900 added huge 11.40 lacs OI with short covering seen at 7700 and below strike prices. Put option 8300-7800 added huge 20.94 lacs OI with profit booking seen at 7700 and below strike prices. 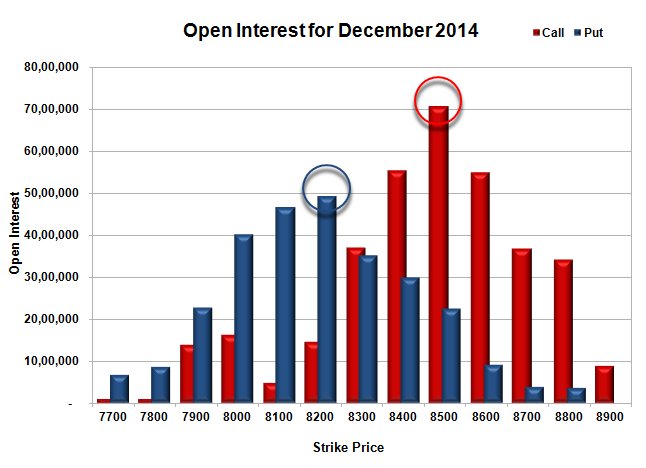 Nifty Open Interest is at 2,13,17,350 up by 2,20,075, with small increase in price, most probably long build-up. 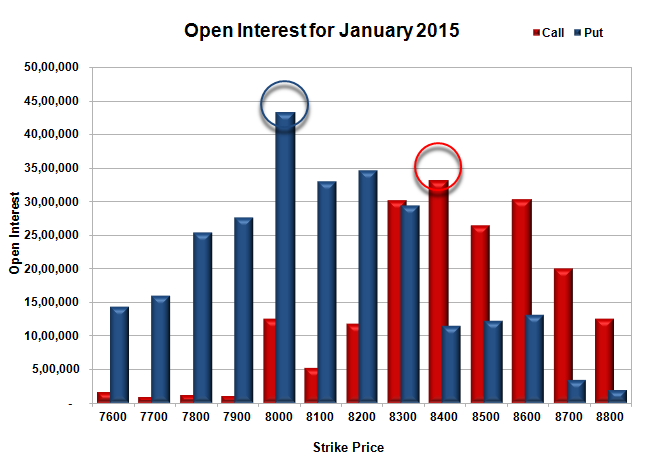 Bank Nifty Open Interest is at 19,18,750 up by 1,27,300, with increase in price, most probably long build-up. FII’s bought huge 5.28 lacs Futures, which includes 21762 contracts long build-up and 660 contracts short build-up, with increase in net OI by 22422 contracts (includes 29205 longs to 8103 shorts for the day) and the Average Price comes to 8559.31. FII’s Index future open contract as on date is 592390 Longs to 74310 Shorts, net long 518080 up by 21102 contracts. Initial support at 8300, with OI of 37.52 lacs and below that at 8200 with OI of 44.16 lacs. Initial and best resistance at 8400, with OI of 35.03 lacs and above that at 8600 with OI of 34.13 lacs. 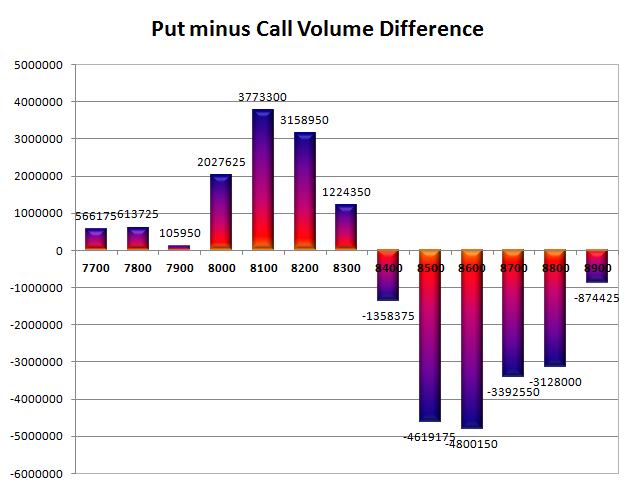 Day Range as per Option Table is 8177 - 8314 and as per VIX is 8184 - 8312 with 8246 as the Pivot. The index opened flat to positive but saw huge buying within the first few minutes to make a high of 8279. Profit booking from higher levels saw the index close at 8246.30, gain of 45.60 points. The broader market was also positive, with 945 advances to 580 declines. 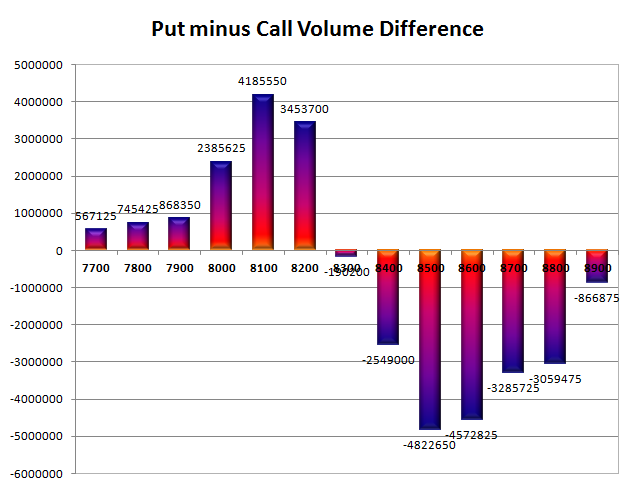 Range as per OI Table developing at the start of the series is 8100-8400. 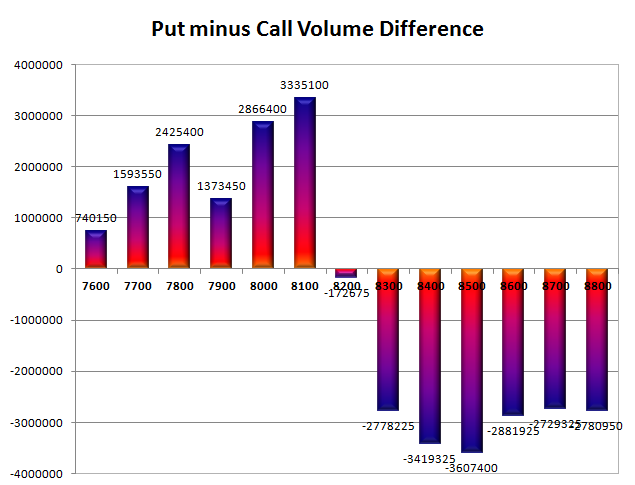 Call option 8400-8800 added huge 8.35 lacs OI with short covering seen at 8300 and below strike prices. 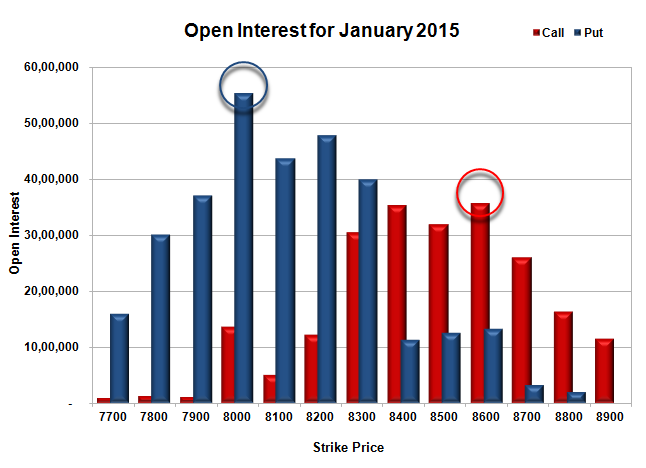 Put option 8300-7600 added huge 29.39 lacs OI with not much change in other strike prices. 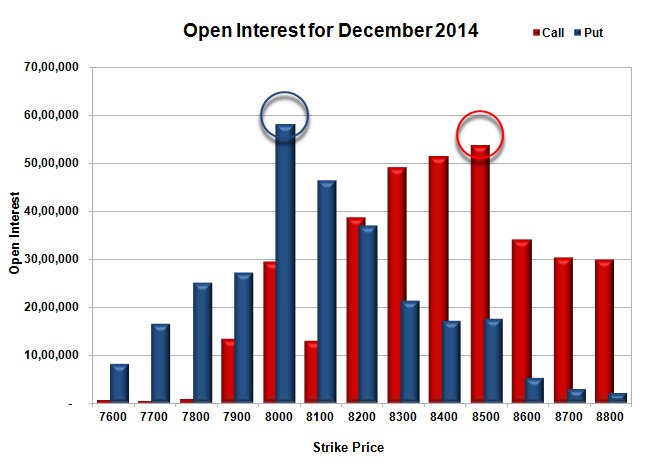 Nifty Open Interest is at 2,10,97,275 up by 3,82,275, with increase in price, most probably long build-up. 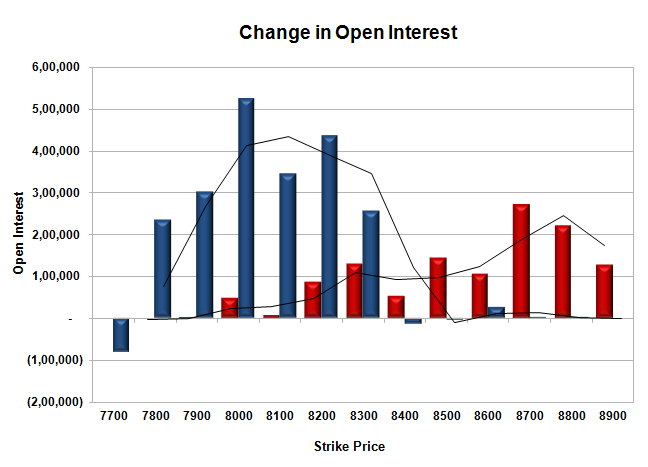 Bank Nifty Open Interest is at 17,91,450 up by 69,825, with small decrease in price, most probably short build-up. FII’s bought huge 7.45 lacs Futures, which includes 29420 contracts long build-up and 393 contracts short covering, with increase in net OI by 29027 contracts (includes 45801 longs to 15988 shorts for the day) and the Average Price comes to 8527.56. 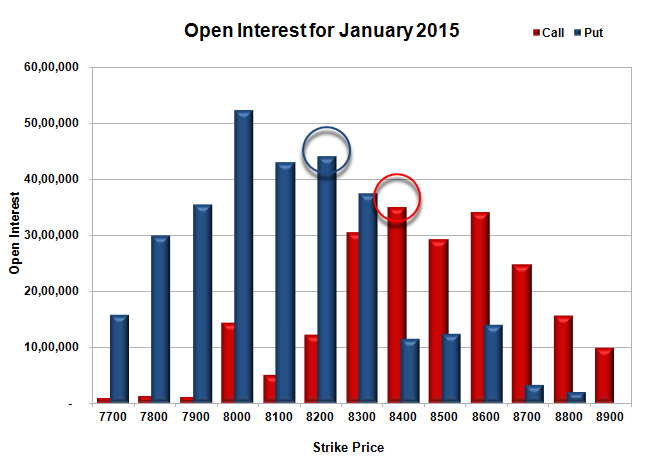 FII’s Index future open contract as on date is 570628 Longs to 73650 Shorts, net long 496978 up by 29813 contracts. Initial support at 8300, with OI of 34.96 lacs and below that at 8200 with OI of 39.82 lacs. Initial and best resistance at 8400, with OI of 34.49 lacs and above that at 8600 with OI of 33.07 lacs. Day Range as per Option Table is 8176 - 8320 and as per VIX is 8183 - 8309 with 8247 as the Pivot. The index opened strong above 8200 but saw profit booking to the lows of the day around 8148 but saw lower level buying to close the day at 8200.70, gain of 26.60 points. The broader market was also positive, with 775 advances to 746 declines. 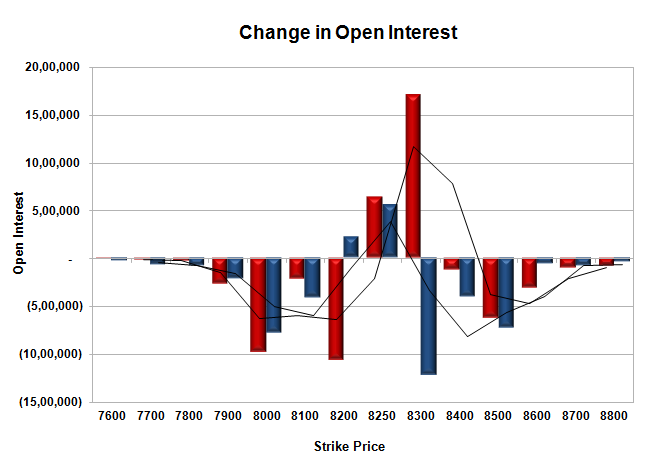 Range as per OI Table developing at the start of the series is 8000-8400. Call option 8200-8700 added huge 16.74 lacs OI. Put option 8200-7600 added huge 23.74 lacs OI with short covering seen at 8400 and above strike prices. Nifty Open Interest is at 2,07,15,000 down by 1,47,425, with not much change in price, most probably long liquidation. 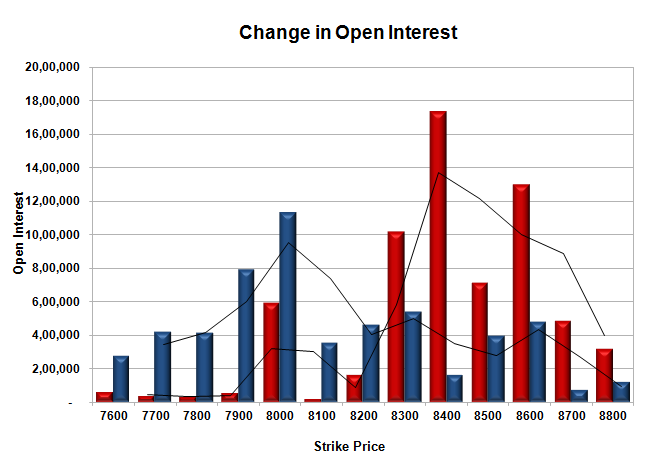 Bank Nifty Open Interest is at 17,21,625 up by 81,800, with not much change in price, most probably short build-up. FII’s sold 0.46 lacs Futures, which includes 2789 contracts long liquidation and 960 contracts short covering, with decrease in net OI by 3749 contracts (includes 17330 longs to 19159 shorts for the day) and the Average Price comes to 8490.84. FII’s Index future open contract as on date is 541208 Longs to 74043 Shorts, net long 467165 down by 1829 contracts. Initial support at 8200, with OI 34.68 lacs and below that at 8000 with highest OI of 43.28 lacs. Initial resistance at 8300, with OI 30.12 lacs and above that at 8400 with huge OI of 33.09 lacs. Day Range as per Option Table is 8124 - 8270 and as per VIX is 8138 - 8264 with 8194 as the Pivot. The index opened flat and stayed within a narrow range but saw huge profit booking in the last hour of trade to close below the psychological level of 8200 at 8174.10, huge loss of 92.90 points. The broader market was also negative, with 715 advances to 784 declines. 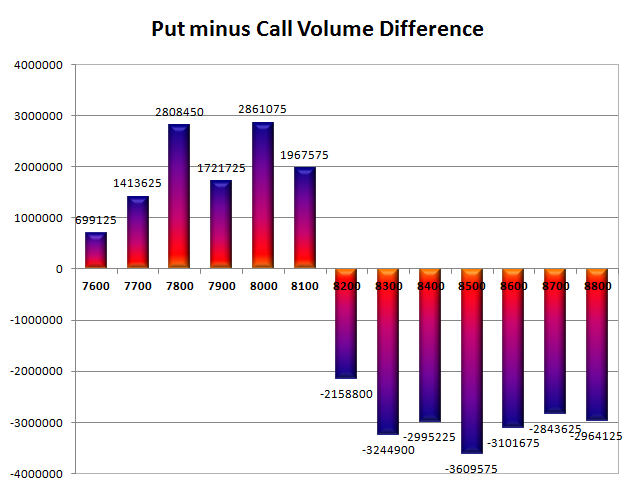 Range as per OI Table at the start of the series is 8000-8400. Call option 8000-8800 added huge 63.11 lacs OI. Put option 8800-7600 added huge 55.81 lacs OI. Nifty Open Interest is at 2,08,62,425 up by huge 49,18,575, with decrease in price, 100% rollover with huge short build-up. Bank Nifty Open Interest is at 16,39,825 up by 5,07,575, with decrease in price, 100% rollover with huge short build-up. FII’s sold 15.59 lacs Futures, which includes 312879 contracts long liquidation and 239066 contracts short covering, with decrease in net OI by 551945 contracts (includes 151786 longs to 214156 shorts for the day) and the Average Price comes to 8492.35. 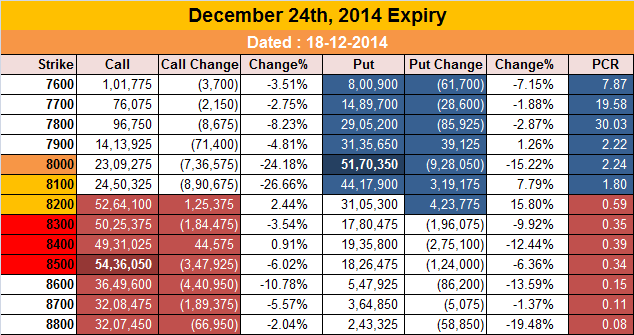 FII’s Index future open contract as on date is 543997 Longs to 75003 Shorts, net long 468994 down by 73813 contracts. Initial support at 8200, with OI 32.55 lacs and below that at 8000 with highest OI of 39.35 lacs. Initial resistance at 8300, with huge addition of 10.14 lacs and above that at 8400 with huge OI of 30.89 lacs. Day Range as per Option Table is 8125 - 8273 and as per VIX is 8110 - 8239 with 8205 as the Pivot. The index opened flat and went on to make a high around 8365 but saw huge profit booking to move to the lows of the day at 8253 and closed at 8267.00, huge loss of 57.00 points. The broader market was also negative, with 488 advances to 1030 declines. Range as per OI Table for expiry is 8100-8400. Call option 8250-8300 added 23.49 lacs OI with profit booking seen at 8400 and above strike prices. Put option 8250-8200 added huge 7.78 lacs OI with short covering seen at 8300 and above strike prices. Nifty Open Interest is at 1,33,59,375 down by huge 45,90,975, whereas Jan series added 51.54 lacs with decrease in price, 100% rollover some short build-up. Bank Nifty Open Interest is at 8,82,350 down by 4,02,575, whereas Jan series added 2.97 lacs with decrease in price, mostly rollover with long liquidation. FII’s bought 17.89 lacs Futures, which includes 69407 contracts long build-up and 2172 contracts short covering, with increase in net OI by 67235 contracts (includes 362482 longs to 290903 shorts for the day) and the Average Price comes to 8335.52. FII’s Index future open contract as on date is 856876 Longs to 314069 Shorts, net long 542807 up by 71579 contracts. Initial support at 8250, with huge OI addition of 5.59 lacs and below that at 8200 with OI of 49.86 lacs. Initial and best resistance at 8300, with highest OI of 54.49 lacs and above that at 8400 with huge OI of 51.49 lacs. 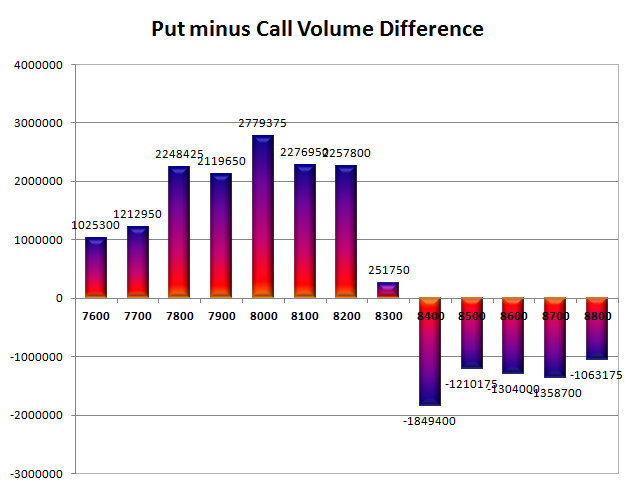 Day Range as per Option Table is 8217 - 8360 and as per VIX is 8201 - 8333 with 8295 as the Pivot. The index opened up around 8255 and stayed positive for the entire session of trade, taking off during the afternoon session to close near the highs at 8324.00, huge gain of 98.80 points. The broader market was also positive, with 885 advances to 625 declines. 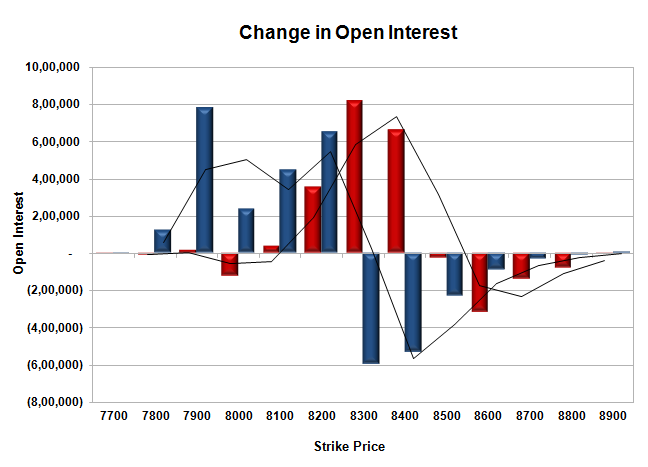 Range as per OI Table has narrowed down to 8100-8400. Call option 8350-8400 added 4.85 lacs OI with short covering seen at 8300 and below strike prices. Put option 8350-8200 added huge 36.32 lacs OI with profit booking seen at 8000 and below strike prices. Nifty Open Interest is at 1,79,50,350 down by huge 18,45,575, whereas Jan series added 44.54 lacs with increase in price, 100% rollover with huge long build-up. Bank Nifty Open Interest is at 12,84,925 down by 1,24,425, whereas Jan series added 3.53 lacs with huge increase in price, 100% rollover with huge long build-up. FII’s bought 1.315 lacs Futures, which includes 99753 contracts long build-up and 94493 contracts short build-up, with increase in net OI by 194246 contracts (includes 258144 longs to 252884 shorts for the day) and the Average Price comes to 8468.91. FII’s Index future open contract as on date is 787469 Longs to 316241 Shorts, net long 471228 up by 5260 contracts. Initial support at 8300, with huge OI addition of 21.58 lacs and below that at 8200 with OI of 47.67 lacs. Initial resistance at 8350, with OI of 21.45 lacs and above that at 8400 with highest OI of 52.76 lacs. 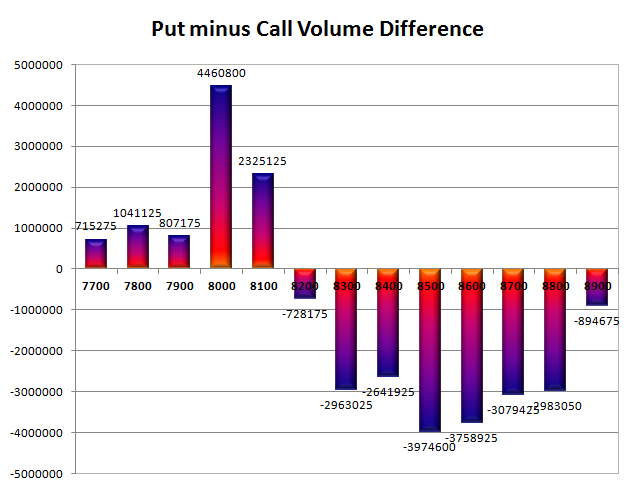 Day Range as per Option Table is 8231 - 8375 and as per VIX is 8262 - 8386 with 8294 as the Pivot. The index opened huge up around 8230 and stayed positive for the entire session of trade within a narrow range and closed around the same level at 8225.20, huge gain of 65.90 points. The broader market was also positive, with 815 advances to 709 declines. 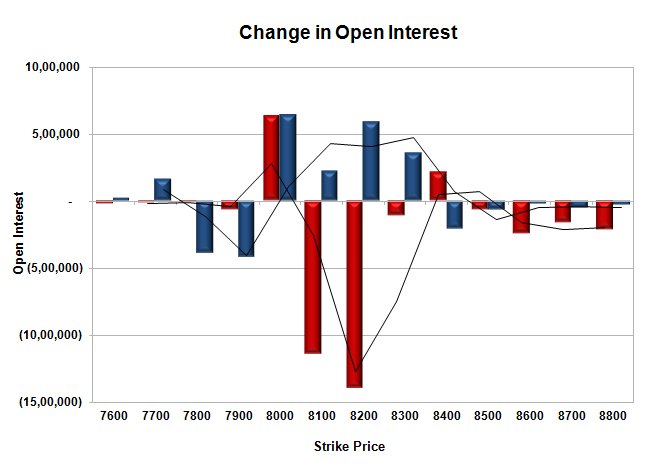 Range as per OI Table has narrowed down to 8100-8500. Call option 8400 added 2.17 lacs OI with short covering seen at 8200 and below strike prices. Put option 8300-8000 added huge 18.18 lacs OI with profit booking seen at 7900 and below strike prices. Nifty Open Interest is at 1,97,95,925 down by huge 22,45,225, whereas Jan series added 27.22 lacs with increase in price, 100% rollover with huge long build-up. Bank Nifty Open Interest is at 14,09,350 down by 2,05,100, whereas Jan series added 1.66 lacs with huge increase in price, mostly rollover with short covering. FII’s sold 1.08 lacs Futures, which includes 17601 contracts long build-up and 21925 contracts short build-up, with increase in net OI by 39526 contracts (includes 202316 longs to 206640 shorts for the day) and the Average Price comes to 8381.14. FII’s Index future open contract as on date is 687716 Longs to 221748 Shorts, net long 465968 down by 4324 contracts. 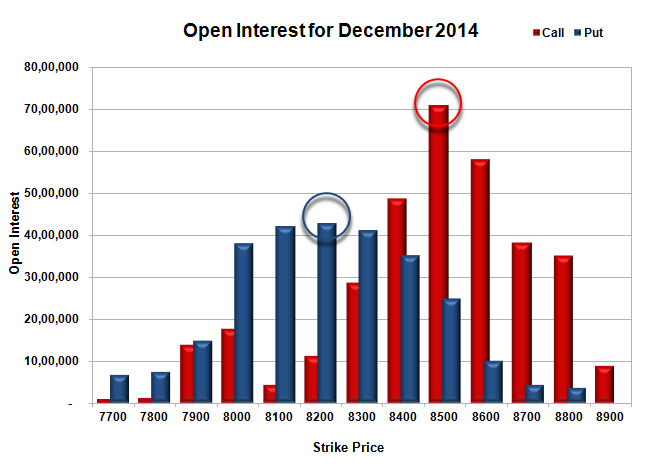 Initial support at 8200, with huge OI addition of 5.92 lacs and below that at 8100 with OI of 46.43 lacs. Initial resistance at 8300, with OI of 49.16 lacs and above that at 8400 with huge OI of 51.48 lacs. 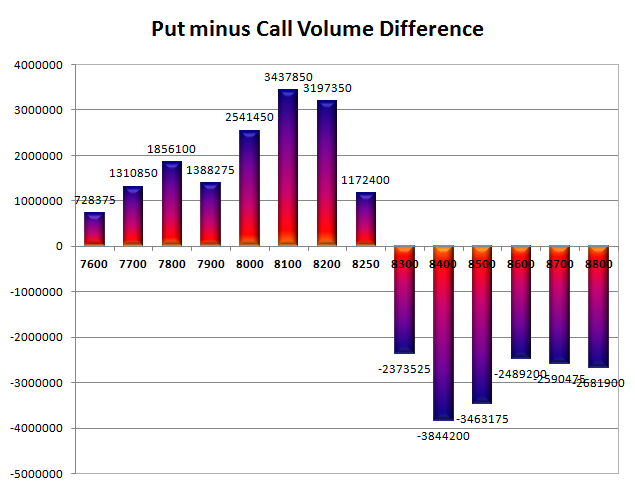 Day Range as per Option Table is 8158 - 8301 and as per VIX is 8163 - 8288 with 8232 as the Pivot. The index opened huge up on the back of good global cues and after an initial dip went up and up to close near the highs at 8159.30, huge gain of 129.50 points. The broader market was also strong, with 1323 advances to 216 declines. 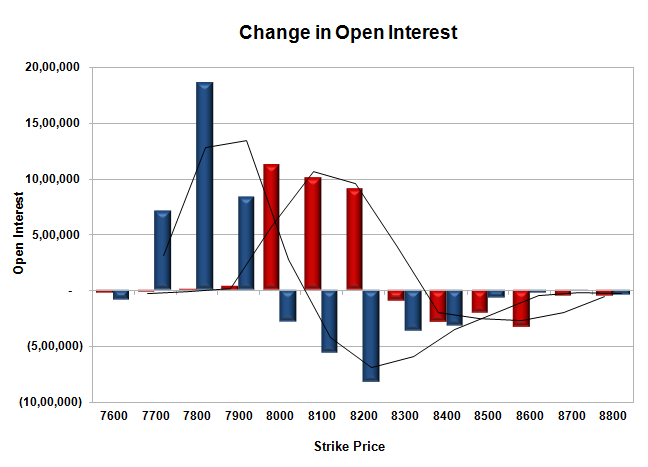 Range as per OI Table comes to 8000-8500. Call option 8200, 8400 added 1.70 lacs OI with short covering seen at 8100 and below strike prices. Put option 8200-8100 added huge 7.43 lacs OI with profit booking seen at 8000 and below strike prices. Nifty Open Interest is at 2,20,41,150 down by huge 19,20,900, whereas Jan series added 13.57 lacs with increase in price, mostly rollover with huge short covering. Bank Nifty Open Interest is at 16,14,450 up by 12,675, whereas Jan series added 0.56 lacs with huge increase in price, probably long build-up. FII’s bought 0.43 lacs Futures, which includes 15473 contracts long build-up and 13736 contracts short build-up, with increase in net OI by 29209 contracts (includes 115299 longs to 113562 shorts for the day) and the Average Price comes to 8345.92. FII’s Index future open contract as on date is 670115 Longs to 199823 Shorts, net long 470292 up by 1737 contracts. Initial support at 8100, with OI of 44.18 lacs and below that at 8000 with huge OI of 51.70 lacs. Initial resistance at 8200, with huge OI of 52.64 lacs and above that at 8300 with OI of 50.25 lacs. 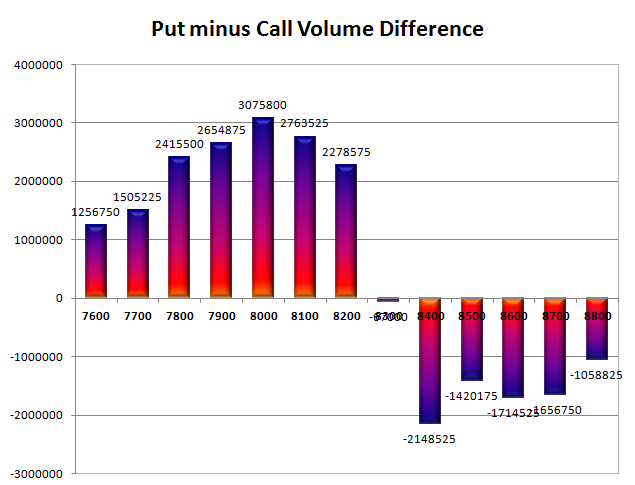 Day Range as per Option Table is 8074 - 8215 and as per VIX is 8097 - 8222 with 8140 as the Pivot. The index opened weak around 8041 and after seeing a jerk towards the highs of the saw huge unwinding to move below the psychological level of 8000 to make a low at 7961. Value buying saw the index close at 8029.80, loss of 37.80 points. The broader market was also weak, with 523 advances to 1019 declines. 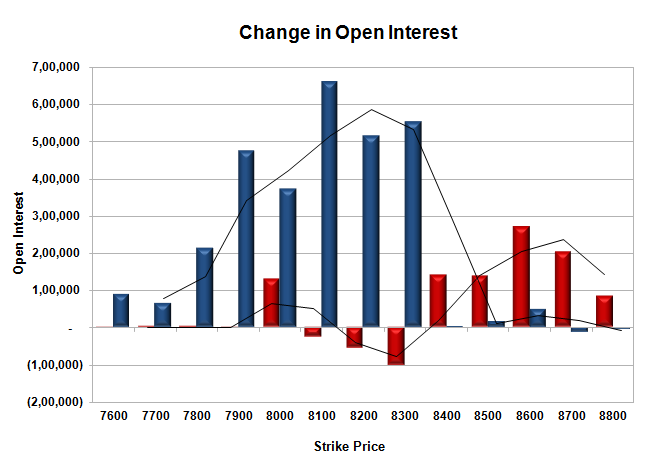 Range as per OI Table comes to 8000-8500. Call option 8000-8200 added huge 30.35 lacs OI with profit booking seen at 8300 and above strike prices. 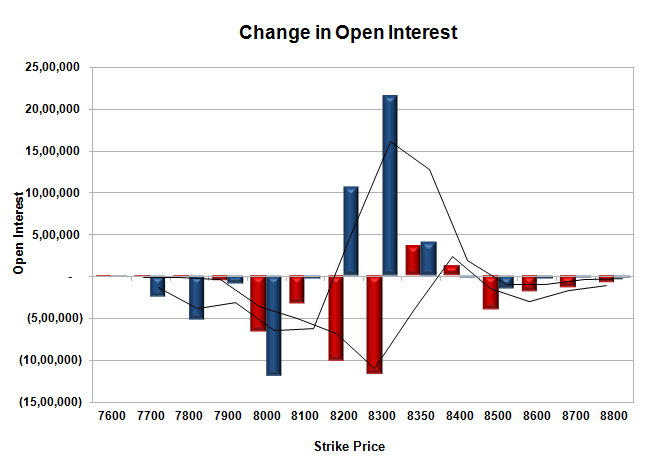 Put option 7900-7700 added huge 34.00 lacs OI with short covering seen at 8100 and above strike prices. 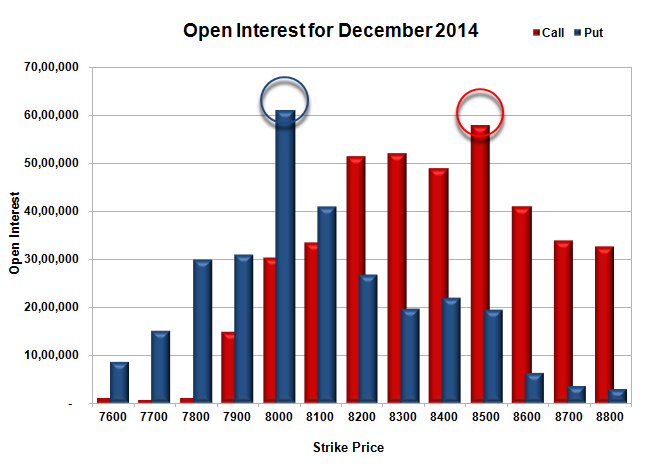 Nifty Open Interest is at 2,39,62,050 up by 12,400, with decrease in price, probably small short build-up. Bank Nifty Open Interest is at 16,01,775 down by 1,64,925, with small increase in price, probably long liquidation. FII’s sold 6.17 lacs Futures, which includes 6376 contracts long liquidation and 18291 contracts short build-up, with increase in net OI by 11915 contracts (includes 117718 longs to 142385 shorts for the day) and the Average Price comes to 8198.23. FII’s Index future open contract as on date is 654642 Longs to 186087 Shorts, net long 468555 down by huge 24667 contracts. Initial and best support at 8000, with highest OI of 60.98 lacs and below that at 7900 with OI of just 30.96 lacs. Initial resistance at 8100, with huge OI addition of 10.07 lacs and above that at 8200 with huge OI of 51.39 lacs. 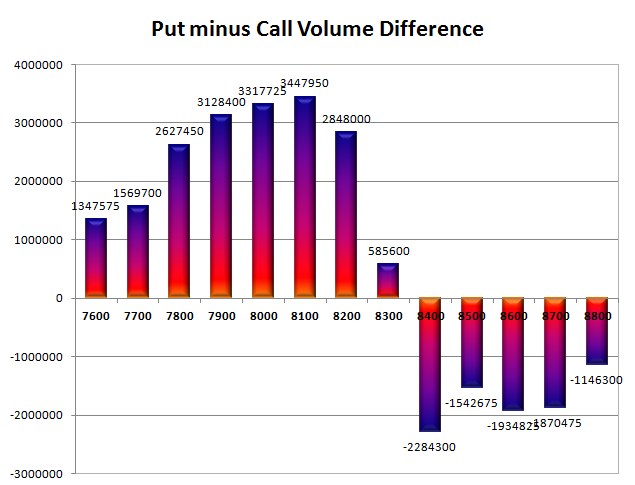 Day Range as per Option Table is 7959 - 8095 and as per VIX is 7959 - 8101 with 8024 as the Pivot. The index opened weak below 8200 and saw huge selling pressure to close below 8100 for the first time after 50 days at 8067.60, huge loss of 152.00 points. The broader market was also very weak, with just 184 advances to 1371 declines. 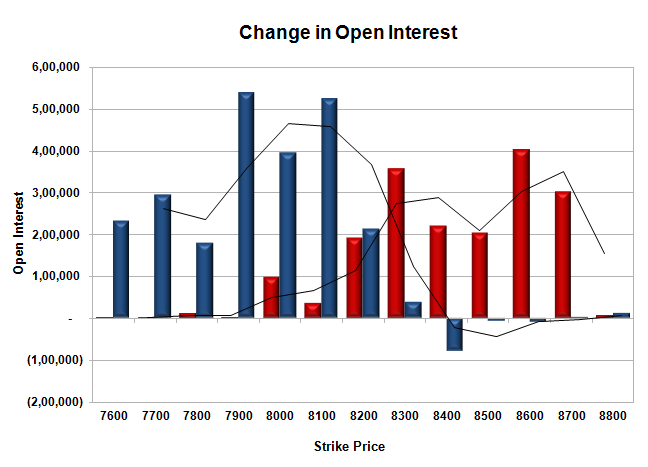 Range as per OI Table comes to 8000-8500. Call option 8000-8300 added huge 65.00 lacs OI with profit booking seen at 8400 and above strike prices. 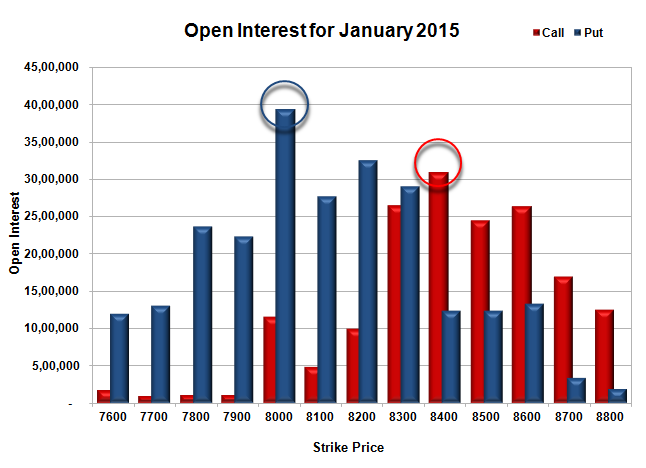 Put option 8000-7700 added huge 27.60 lacs OI with short covering seen at 8200 and above strike prices. 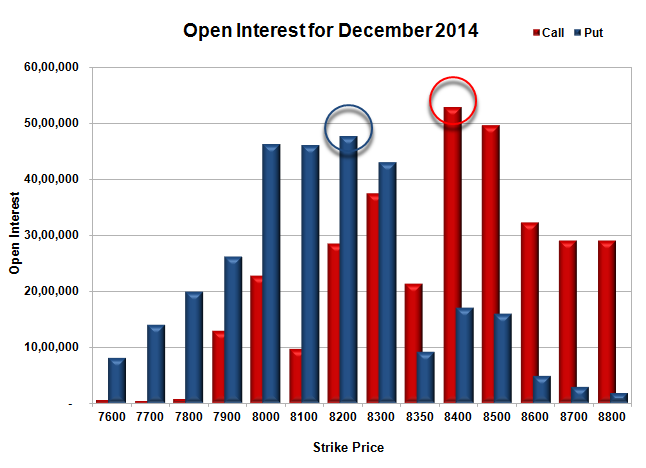 Nifty Open Interest is at 2,39,49,650 up by 4,03,850, with huge decrease in price, probably short build-up. 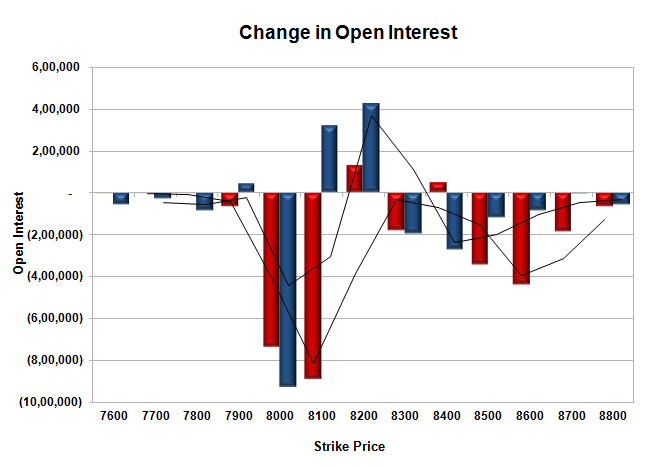 Bank Nifty Open Interest is at 17,66,700 up by 84,075, with huge decrease in price, probably short build-up. FII’s sold 6.18 lacs Futures, which includes 19639 contracts long liquidation and 5084 contracts short build-up, with decrease in net OI by 14555 contracts (includes 143477 longs to 168200 shorts for the day) and the Average Price comes to 8246.13. FII’s Index future open contract as on date is 661018 Longs to 167796 Shorts, net long 493222 down by huge 24723 contracts. Initial support now at 8100, with huge OI of 46.59 lacs and below that at 8000 with highest OI of 63.86 lacs. Initial resistance at 8200, with huge OI addition of 27.56 lacs and above that at 8300 with huge OI of 53.06 lacs. Day Range as per Option Table is 8029 - 8160 and as per VIX is 7999 - 8136 with 8103 as the Pivot. The index opened huge gap-down around 8160 but saw buying interest and covered the early loss to move into positive but closed just below at 8219.60, minuscule loss of 4.50 points. The broader market was also very weak, with just 519 advances to 1005 declines. 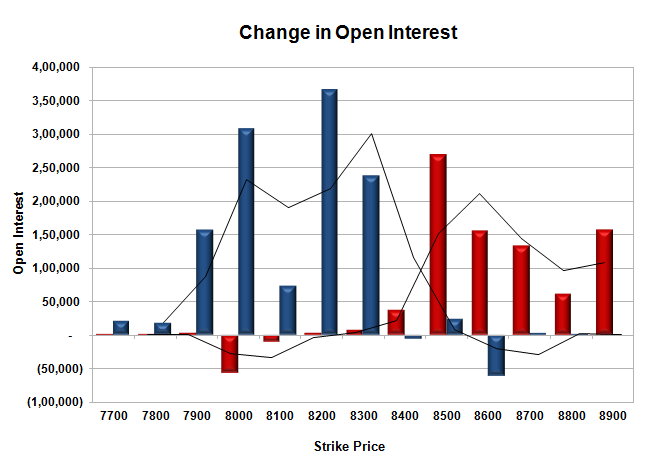 Range as per OI Table comes to 8100-8500. Call option 8200-8400 added huge 18.30 lacs OI with profit booking seen at 8500 and above strike prices. Put option 8200-7800 added huge 22.29 lacs OI with short covering seen at 8300 and above strike prices. 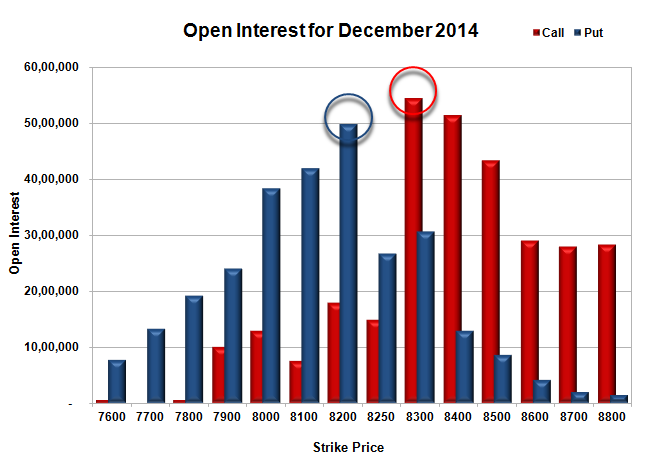 Nifty Open Interest is at 2,35,45,800 up by 3,99,725, with no change in price, probably short/long build-up. 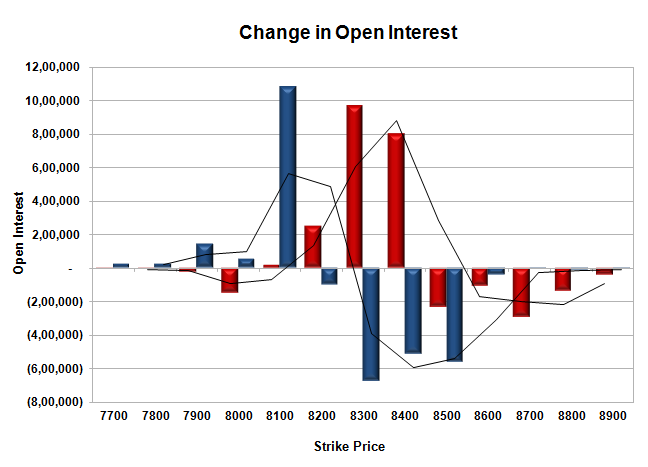 Bank Nifty Open Interest is at 16,82,625 down by 90,175, with increase in price, probably short covering. FII’s bought 1.66 lacs Futures, which includes 7622 contracts long build-up and 984 contracts short build-up, with increase in net OI by 8606 contracts (includes 81331 longs to 74693 shorts for the day) and the Average Price comes to 8403.31. FII’s Index future open contract as on date is 680657 Longs to 162712 Shorts, net long 517945 up by 6638 contracts. Initial and best support now at 8200, with huge OI of 49.29 lacs and below that at 8100 with OI of 46.64 lacs. Initial resistance at 8300, with huge OI addition of 8.16 lacs and above that at 8400 with huge OI of 55.38 lacs. 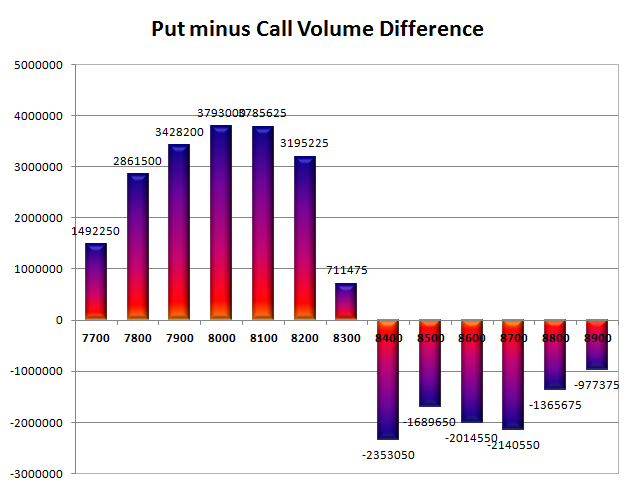 Day Range as per Option Table is 8150 - 8277 and as per VIX is 8159 - 8280 with 8205 as the Pivot. The index opened flat to positive but saw huge profit booking making lower lows with each passing hour to the day near the lows at 8224.10, huge loss of 68.80 points. The broader market was also very weak, with just 357 advances to 1173 declines. 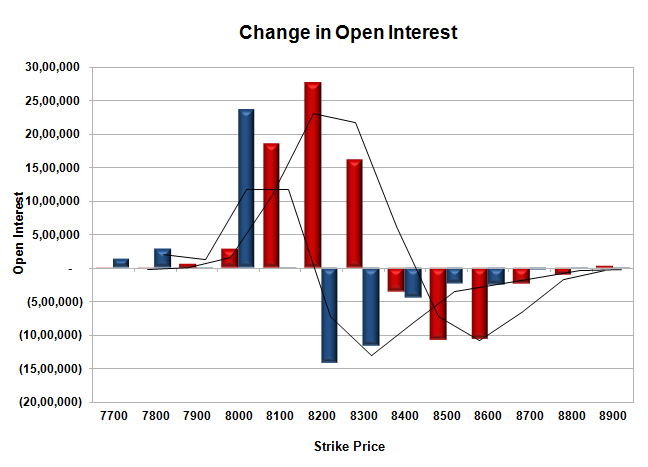 Range as per OI Table comes to 8100-8600. Call option 8200-8400 added huge 20.20 lacs OI with profit booking seen at 8500 and above strike prices. Put option 8100-7900 added huge 12.78 lacs OI with short covering seen at 8300 and above strike prices. 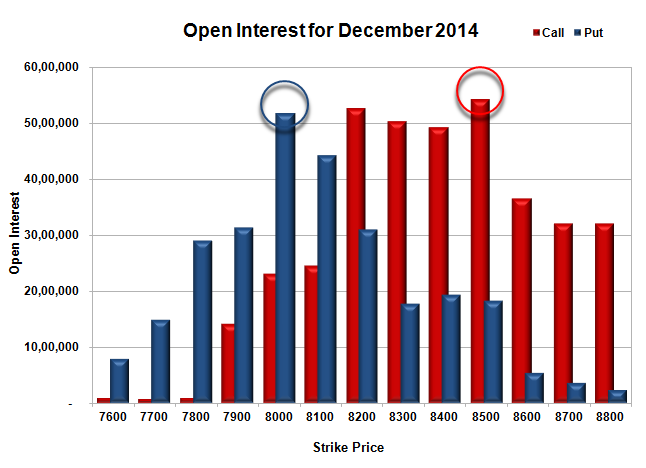 Nifty Open Interest is at 2,31,46,075 up by 10,02,650, with decrease in price, probably short build-up. Bank Nifty Open Interest is at 17,72,800 down by 14,400, with decrease in price, probably long liquidation. FII’s bought 3.64 lacs Futures, which includes 37670 contracts long build-up and 23121 contracts short build-up, with increase in net OI by 60791 contracts (includes 82361 longs to 67812 shorts for the day) and the Average Price comes to 8401.37. FII’s Index future open contract as on date is 673035 Longs to 161728 Shorts, net long 511307 up by 14549 contracts. Initial and best support now at 8200, with huge OI of 42.81 lacs and below that at 8100 with OI of 42.16 lacs. Initial resistance at 8300, with huge OI addition of 9.66 lacs and above that at 8400 with huge OI of 48.78 lacs. 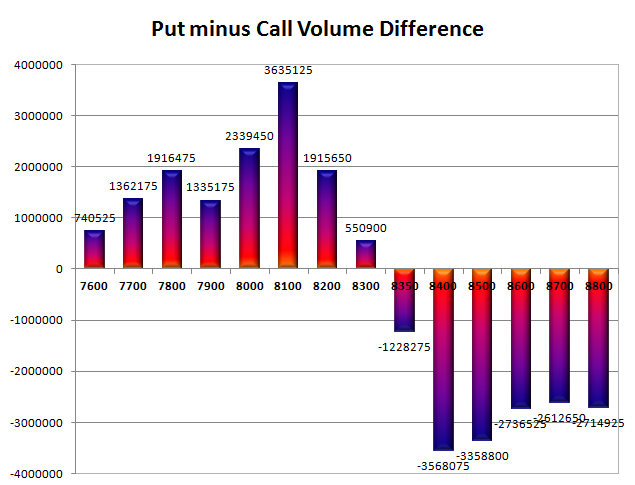 Day Range as per Option Table is 8188 - 8309 and as per VIX is 8165 - 8283 with 8254 as the Pivot.